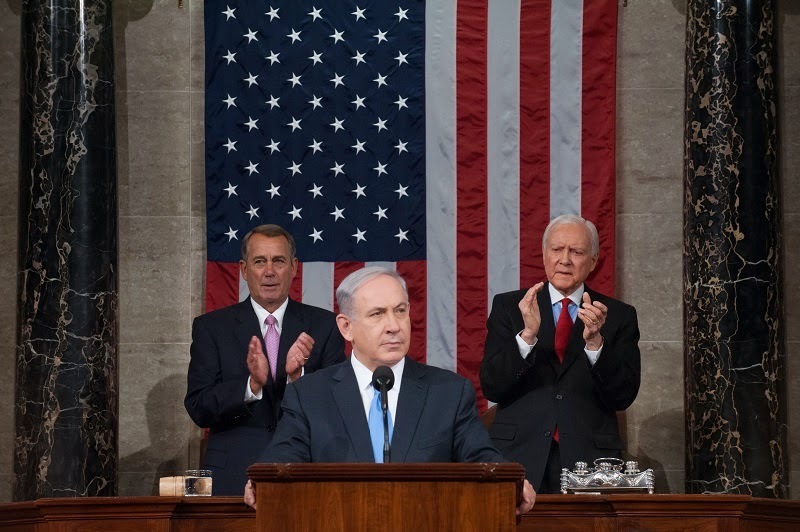 On 3th March, Prime Minister Banjamin Netanyhahu of Israel gave a major speech at the United States Congress. The leit motiv was the apparently impending agreement being reached is the so-called P5+1 (United Kingdom, Russia, Unites States, France, China + Germany) – Iran negotiations on the latter’s nuclear programme. Benjamin Netanyahu addressing a joint session of the United States Congress. http://mfa.gov.il/MFA/PressRoom/2015/Pages/PM-Netanyahus-speech-to-Congress-3-March-2015.aspx , was predictably applauded by most Israelis, American Jews and Republican Congressmen and criticised by the White House and left-wing Democrats. There are three different target audiences: the Israeli public who will vote in general elections on 17th March, the Americans (Congress, White House and the public) and Iran. 1- Extolls the virtues and resilience of the US-Israeli alliance. 2- Thanks Obama for all the visible and invisible things he has done for Israel. And he managed to utter these words with a serious demeanor. 3- Thanks the US Congress for being a stalwart friend of Israel. The remarkable alliance between Israel and the United States has always been above politics. It must always remain above politics. Because America and Israel share a common destiny, the destiny of promised lands (…). Israel is grateful for the support of America's people and of America's presidents, from Harry Truman to Barack Obama. We appreciate all that President Obama has done for Israel. Now, some of that is widely known. (…) And some of what the president has done for Israel might never be known. Then the Prime Minister moves on to the crux of the matter: IRAN. He presents the issue in two different angles: what is at stake for Israel – her very survival; and the intrinsic evil of Tehran’s regime. On the former, Netanyahu accuses Tehran of aiming for the total destruction of Israel, underlining that it is not just the goal of a lone craze like former President Ahmadinejad, but the avowed desire of the very top leadership of Iran from Khomeini to Khamenei. Today the Jewish people face another attempt by yet another Persian potentate to destroy us. Iran's Supreme Leader Ayatollah Khamenei spews the oldest hatred, the oldest hatred of antisemitism with the newest technology. He tweets that Israel must be annihilated. On the latter, Netanyahu goes far beyond the nuclear programme and exposes the geopolitical and terrorist threat posed by Iran. Accordingly, he lays out the mischief Tehran has been conducting across the Middle East and beyond through the promotion of terrorism. Netanyahu points to Iran extending her tentacles all the way from Beirut and Damascus to Baghdad and Sanaa, including the mouths of the Persian Gulf (Strait of Hormuz) and the Red Sea (Bab el Mandeb Strait). So, while the P5+1 are trying to accommodate Iran and her nuclear programme, the ayatollahs are relentlessly spreading Iran’s power and influence across the region. An agreement with Iran and the end of sanctions would give Tehran more room and means to attain its hegemonic goals. Iran's founding document pledges death, tyranny, and the pursuit of jihad. And as states are collapsing across the Middle East, Iran is charging into the void to do just that. Iran's goons in Gaza, its lackeys in Lebanon, its revolutionary guards on the Golan Heights are clutching Israel with three tentacles of terror. Backed by Iran, Assad is slaughtering Syrians. Backed by Iran, Shiite militias are rampaging through Iraq. Backed by Iran, Houthis are seizing control of Yemen, threatening the strategic straits at the mouth of the Red Sea. Along with the Straits of Hormuz, that would give Iran a second choke-point on the world's oil supply. Netanyahu tries to show how hostile and damaging the Islamic Republic has been to the Unites States and her interests, recollecting instances in which Iran took or abetted actions that cost dearly in terms of American lives. This way, Mr. Netanyahu hopes to revive the fear of and the hostility to Iran thus increasing the Americans’ propensity to reject a deal with Tehran. Just last week, near Hormuz, Iran carried out a military exercise blowing up a mock U.S. aircraft carrier. (…), while they're having nuclear talks with the United States. But unfortunately, for the last 36 years, Iran's attacks against the United States have been anything but mock. And the targets have been all too real. The “Death to America” cry continues to be a staple in regime demonstrations in Iran, to the Iran Revolutionary Guards Corps and to the IRGC-backed Shiite militias in Iraq. And he reaches the climax of his attack on Iran when he puts the Islamic Republic and the Islamic State on an equal footing: two sides of the same coin. Two sides of the same radical, zealot, barbaric ideology, both casting a shadow of death, oppression and bigotry across the Middle East. Both are intrinsically hostile to the West, to Christians, to the USA and, of course, to Israel. Both are irredentist, uncompromising, ruthless and deadly. And then the striking contrast: you are fighting the knife-wielding ones and you cooperate with the nuclear bomb-seekers. The difference is that ISIS is armed with butcher knives, captured weapons and YouTube, whereas Iran could soon be armed with intercontinental ballistic missiles and nuclear bomb. Netanyahu proceeds to the core issue that took him to Capitol Hill: THE NUCLEAR DEAL. He focuses on two main concessions being given to Iran. The first one is the supposed preservation of the bulk of the Iranian nuclear infrastructure intact, namely all of the known facilities and the vast majority of the centrifuges. Thus, Netanyahu concludes the obvious: Iran’s nuclear breakout time will be quite short, a fact compounded by the limitations of inspections (as shown in the case of North Korea) and in Iran’s own extensive record of cheating, concealing and non-compliance with relevant UNSC Resolutions. Like North Korea, Iran, too, has defied international inspectors. It's done that on at least three separate occasions (…). Like North Korea, Iran broke the locks, shut off the cameras. The (…) IAEA, said again yesterday that Iran still refuses to come clean about its military nuclear program. Iran was also caught (…) operating secret nuclear facilities in Natanz and Qom, facilities that inspectors didn't even know existed. Right now, Iran could be hiding nuclear facilities that we don't know about, (…) Iran has proven time and again that it cannot be trusted. The second damning concession that consumes the Israeli Prime Minister is the so-called “sunset clause”, i.e. after about 10 years, the terms of the deal (limitations to the nuclear programme) will expire and Iran will be allowed to operate a full-fledged nuclear enterprise, giving her all the conditions for a nuclear breakout should she choose to do so. But the second major concession creates an even greater danger that Iran could get to the bomb by keeping the deal. Because virtually all the restrictions on Iran's nuclear program will automatically expire in about a decade. (…)We all have a responsibility to consider what will happen when Iran's nuclear capabilities are virtually unrestricted and all the sanctions will have been lifted. Iran would then be free to build a huge nuclear capacity that could produce many, many nuclear bombs. Iran's Supreme Leader says that openly. He says Iran plans to have (…), not 6,000 or even the 19,000 that Iran has today, but 10 times that amount – 190,000 centrifuges enriching uranium. With this massive capacity, Iran could make the fuel for an entire nuclear arsenal and this in a matter of weeks, once it makes that decision. Netanyahu adds an oft-ignored aspect: Iran’s ballistic missile programme, specially its intercontinental vector (ICBM) is strongly connected to a military dimension of the nuclear project. The two make Iran an accrued threat, even for the US homeland. (…) if Iran's intercontinental ballistic missile program is not part of the deal, and so far, Iran refuses to even put it on the negotiating table. Well, Iran could have the means to deliver that nuclear arsenal to the far-reaching corners of the Earth (…). Concluding this part of the speech, the US Congress guest lays out the geopolitical consequences of a lopsided agreement between the P5+1 and Iran: Iran would feel more confident to expand her sphere of influence and more comfortable to destabilise her regional rivals, like Saudi Arabia, Egypt and even Turkey, to harass her nemesis (Israel) and to confront outside powers such as the United States. Furthermore, the medium-term prospect of a nuclear-armed Iran would likely spur the likes of Saudi Arabia, Turkey, Egypt and the United Arab Emirates to embark on their own nuclear programmes aiming to attain their own nuclear arsenals, therefore setting off a nuclear arms race in the globe’s most volatile region. This deal won't be a farewell to arms. It would be a farewell to arms control. Contrary to what Obama rushed to say, Netanyahu did propose alternatives to Obama’s own deal. However, his proposals fall out of the scope of the negotiations. Admittedly, the Middle East would be a better place if they were implemented, but that would entail a fundamental change of Iran’s geopolitical behaviour and that is really not in the cards, even less so given the perceived weakness of the US Administration. (…)If Iran changes its behavior, the restrictions would be lifted. If Iran doesn't change its behavior, the restrictions should not be lifted. If Iran wants to be treated like a normal country, let it act like a normal country. Netanyahu sounds more credible when disassembling the claim that “there is no alternative to the deal being negotiated”. Of course that is a flat lie and Netanyahu simply suggests that the P5+1 go tough on Iran, call her bluff and turn the tables. The truth is that Iran is the needier part of the negotiations. As we have defended more than once in this blog, if the USA did not act as being desperate for a deal, she could actually get a better one. The Israeli Prime Minister just says that no deal is better than a bad one and that there are alternatives to a bad deal besides war, though the latter should not be discarded. What about the argument that there's no alternative to this deal, that Iran's nuclear know-how cannot be erased, that its nuclear program is so advanced that the best we can do is delay the inevitable, (…)? Now, if Iran threatens to walk away from the table call their bluff. They'll be back, because they need the deal a lot more than you do. (…) for over a year, we've been told that no deal is better than a bad deal. Well, this is a bad deal. It's a very bad deal. We're better off without it. Now we're being told that the only alternative to this bad deal is war. That's just not true. The alternative to this bad deal is a much better deal: a better deal that doesn't leave Iran with a vast nuclear infrastructure and such a short breakout time; a better deal that keeps the restrictions on Iran's nuclear program in place until Iran's aggression ends; a better deal that won't give Iran an easy path to the bomb; a better deal that Israel and its neighbors may not like, but with which we could live, literally. The final stretch of the speech is more emotionally charged, with a reference to Nobel Laureate Elie Wiesel and to the Holocaust. Basically, Benjamin Netanyahu vows that, in the worst case scenario, Israel will not sit idly nor will she sheepishly walk to the slaughterhouse. Rather, Israel will fight and will defend herself with every means available and, so he believes, with the help of the US. We must now choose between two paths. One path leads to a bad deal that will at best curtail Iran's nuclear ambitions for a while, but it will inexorably lead to a nuclear-armed Iran whose unbridled aggression will inevitably lead to war. The second path, however difficult, could lead to a much better deal, that would prevent a nuclear-armed Iran, a nuclearized Middle East (…). (…)as Prime Minister of Israel, I can promise you one more thing: Even if Israel has to stand alone, Israel will stand. But I know that Israel does not stand alone. I know that America stands with Israel. (…) And before the people of Israel entered the Land of Israel, Moses gave us a message that has steeled our resolve for thousands of years. I leave you with his message today, 'Be strong and resolute, neither fear nor dread them. Netanyahu faced a great challenge in his most awaited for speech. * He had to prove that the deal being negotiated is a flawed one that endangers the world, the Middle East and, particularly, Israel. * He had to show there was an alternative to it. * He had to show gratitude and deference to his hosts. * He had to show strength and resolve to his enemies. * And he had to convince the Israelis, to sway the Americans and to convey doubt to the Iranians. Even if it was not a resounding victory, Netanyahu scored points across the board.